Still excited about the G1! Good stuff. I like the thick sound... Reminds me a bit of the Black Keys or a sleepy Fu Manchu. I'll definitely seek out their stuff. It got me thinking of some of the best use of a song in adverts... Recently, the most successful (on me) were the Dell ads last year using the Flaming Lips "W.A.N.D." This ad was for the Inspiron, I bought a red XPS which used another great song, "Watch us work it" by Devo. Ooops, got sidetracked on YouTube... Came across this video that made me cry. Damn I miss my MkII. 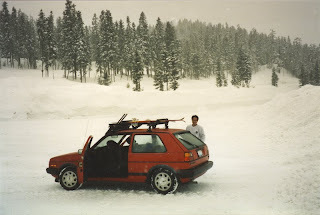 Mine was an 8v so I didn't have the round headlights, but it was red, with a rack (Yakima) and in the winter I rolled Hakkapeliittas on the 16v teardrops. There will never be a car that touches my heart like that one. EVER! 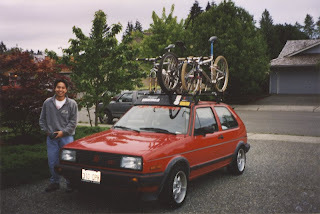 BTW that is my mountain bike/snow board buddy Mike in both pictures... Lots of good times with the bikes or snowboards on the rack.